Geometrics! You see them everywhere – home decor, fashion, logo designs, product designs. 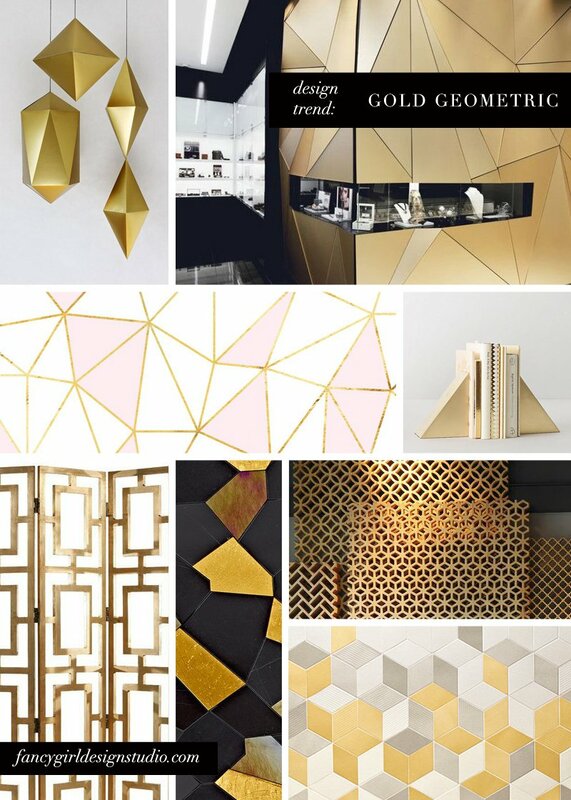 I absolutely LOVE how geometric designs look when they’re rendered in gold or rose gold. It’s gorgeous!!! It’s a sort of 21st century take on art deco combined with 80’s Memphis Group influence, as well as some obviously asian inspirations. It gives designs an edgy and glamorous look. This year, this trend has been very evident in packaging design, web design, and interior design. Try looking a product catalogs of popular design stores and you are bound to see at least one metallic geometric candleholder, lamp, terrarium, or paperweight. Geometrics is not a modern design trend. We don’t own this. The Ancient Greeks and Moroccans both used bold geometric patterns as part of their architectural and interior design. Asian art is full of geometric motifs. And don’t forget the Art Deco movement in the early 1900’s. I think our contemporary contribution to this is the irregularity of the patterns – the low poly look (think Android wallpaper), and the randomness of the shapes. It’s a very bold, strong look, very much in keeping with the times. I created the mood board above from my Pinterest board that I’ve been silently curating since last year. I just love Pinterest! It’s such an invaluable tool to me, as a designer. Every time I spot a trend, I create a board for it so I’ll know to watch out for how the design world is using each one.